Everything was perfect. Apartment was clean, fresh, modern, absolutely amazing. Location is perfect, very close to the old town. Also there is a grocery store, bakery and coffee shop in front of the apartment that we used on daily base. The host is great. She met us at 11 o'clock in the evening and ordered us a pizza haha. Such a friendly and nice person. Definitely recommend Apartment Siesta. The apartment is very nice and clean. The location is great, it is very close to the old town. WiFi is good. There is an excellent bakery and grocery store in front of the apartment. Appartement fonctionnel et bien équipé . Refait à neuf . Lock in a great price for Apartment Siesta – rated 9.1 by recent guests! Apartment Siesta in Split has accommodations with free WiFi, 1.2 miles from Diocletian's Palace and 2.7 miles from Znjan Beach. The Joker Shopping Centre is within a 14-minute walk of the apartment. 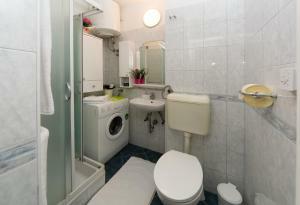 The apartment is composed of a dining area, a fully equipped kitchen, and 1 bathroom. A flat-screen TV with cable channels is offered. Gregory of Nin is 0.8 miles from the apartment, while Split Archaeological Museum is a 19-minute walk from the property. The nearest airport is Split Airport, 14 miles from the property. When would you like to stay at Apartment Siesta? This apartment has a toaster, stovetop and seating area. Apartment Siesta smješten je u stambenoj zgradi, na 3. katu, siguran je od provalnika tako da u bilo koje doba dana možete ostaviti prozore otvorenim i osjećati se sigurno tijekom noći. Ako dolazite sa automobilom uvijek ćete pronaći besplatni parking u krugu od 100 metara, od objekta. Apartman je novo namješten ali u duhu domaćina. Želja nam je da se osjećate kao kod svoje kuće. Kuhinja je opremljena električnom pločom, pećnicom, velikom radnom površinom, velikim frižiderom i zamrzivačem. Kuhalo za vodu, aparat za kokice i mikser su vam na raspolaganju, te šećer, sol, papar, kava, čajevi.....Soba je prostrana, sa velikim bračnim ležajem i ležajem za 1 osobu., a tu se nalazi i udoban dvosjed sa stolićem za dnevno opuštanje uz kavu, čaj.....uz TV. Dostupna je i literatura na engleskom jeziku, od beletristike do vodiča o Hrvatskoj, Splitu, sa planom grada Splita. Apartman je klimatiziran i pokriven besplatnim WI FI. Garantiramo besprijekornu čistoću i urednost apartmana. House Rules Apartment Siesta takes special requests – add in the next step! Please inform Apartment Siesta of your expected arrival time in advance. You can use the Special Requests box when booking, or contact the property directly using the contact details in your confirmation.